Have you ever felt like your weekend was so incredible and full of new experiences that it lasted an entire week? That is certainly how this past weekend felt for me! I decided to plan ahead and take a break from the daily routine of studio work on the weekends with the occasional visit to the Umeå city center. 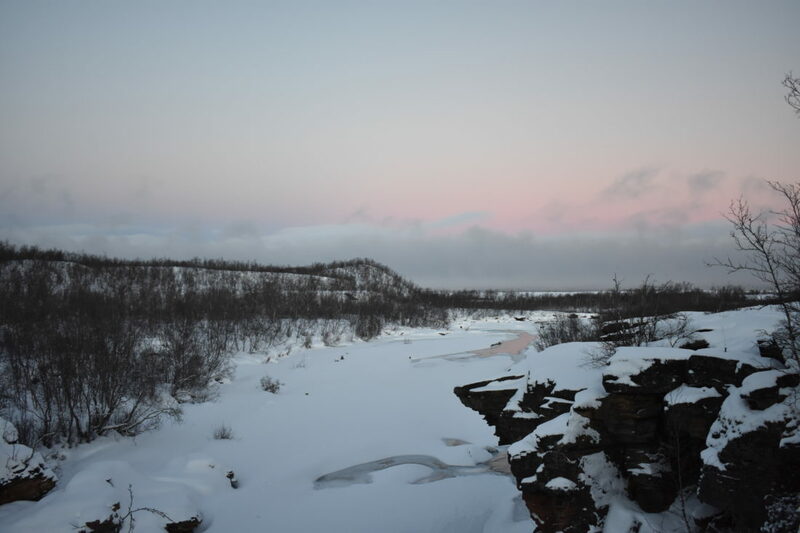 My classmates and I researched easy trips to do around Umeå, and discovered that just a few hours away was a beautiful National Park, Björnlandet. We rented snowshoes from the local gym facility, IKSU, hired car from the Umeå airport, and drove out Saturday morning after a few rounds of coffee. Björnlandet turned out to be the perfect choice for adventure. 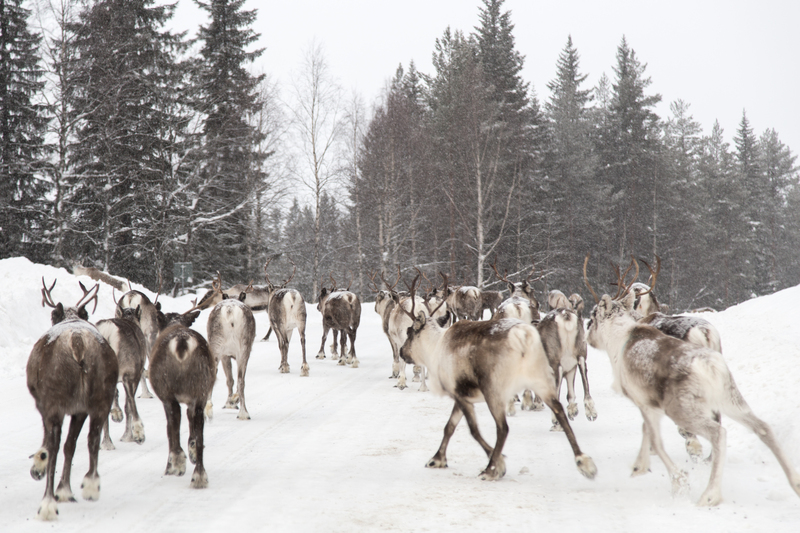 Navigating our way through several herds of reindeer on the country road to the national park, it quickly became apparent that these creatures weren’t very afraid of cars, they didn’t want to move! 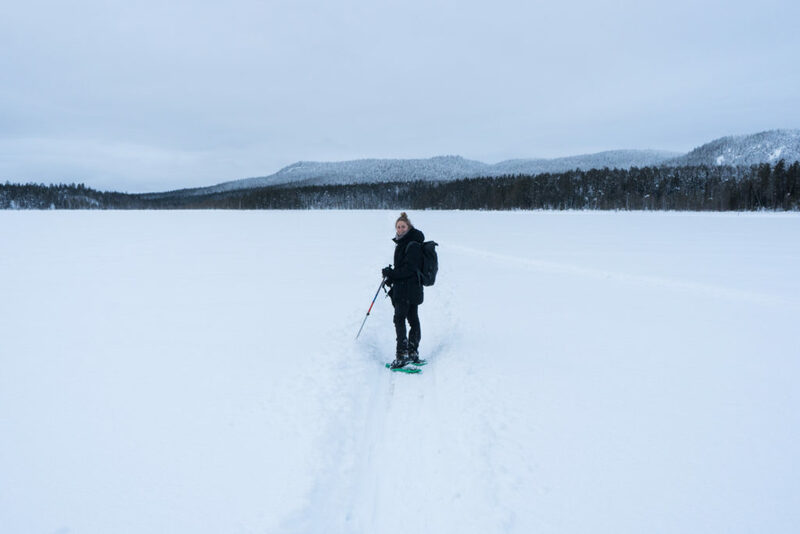 Since there was so much snow, all the trail signs were covered, and we resorted to following old snowmobile tracks in our snowshoes across the frozen lake. 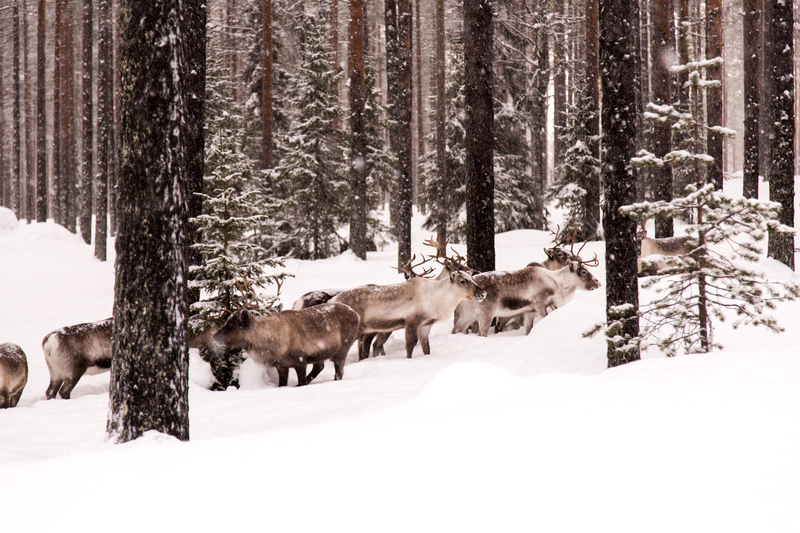 What hard work… Criss-crossing across our path were many sets of moose tracks…if only we could spot one! Across the lake was a beautifully maintained wooden cabin where we set up camp for a few hours to enjoy some fika and lunch. This cabin is only one of the many cabins in the area. 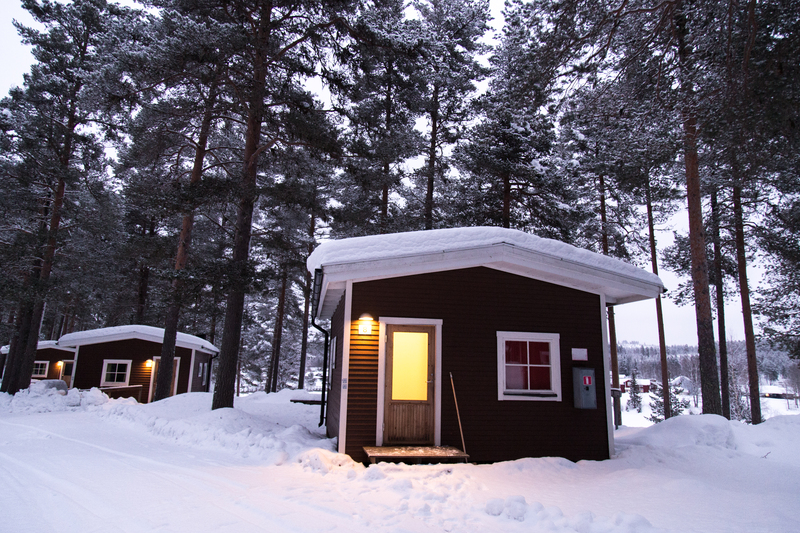 In fact, Sweden is full of cabins that are equipped with beds, stoves, wood, candles, etc. Some of these cabins scattered throughout the county are more accessible than others, some must be booked and a fee paid, while others are drop-in, and free of charge. 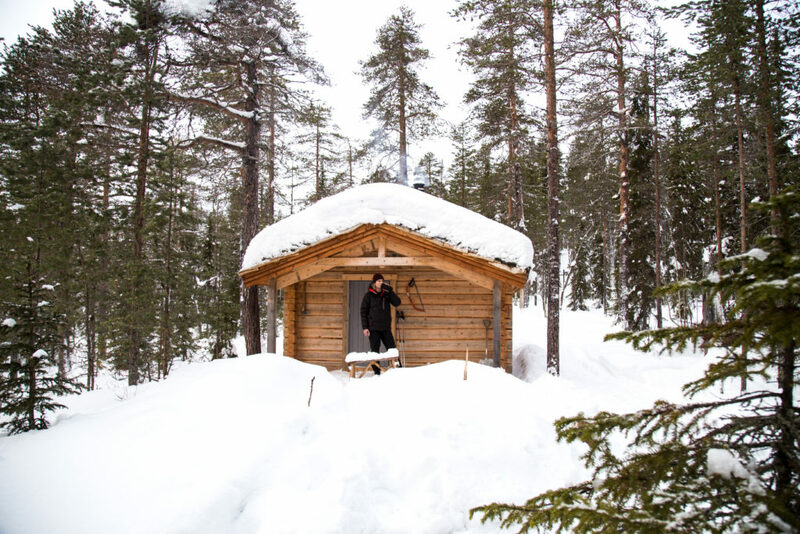 If you are looking for a peaceful weekend in the wilderness, and want a place to stay that is less rugged than a tent, I would highly recommend looking into your proximity to one of these cabins. 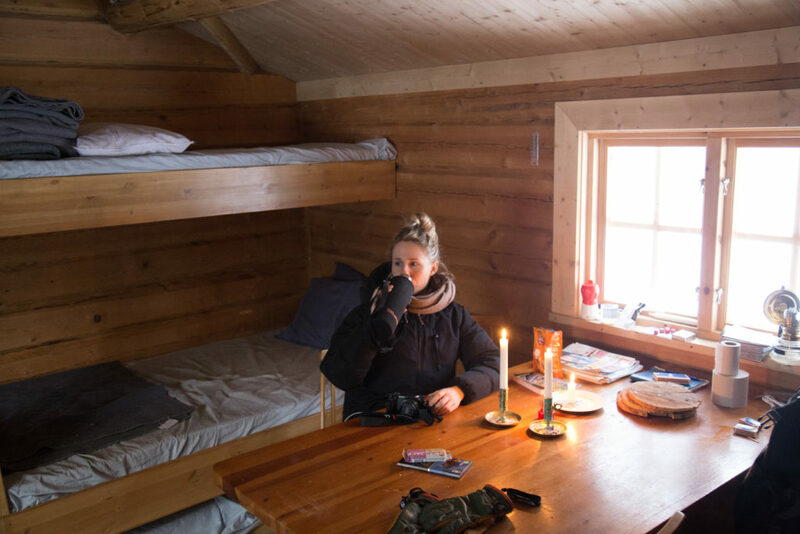 There are also other amazing options for sleeping out in the wilderness around Sweden, check them out here! After some off-trail, accidental deep snow exploration in our snowshoes, we made our way back across the lake and to the car, soaking wet, and ready for dinner! Driving an hour and half north east, we arrived at our second destination for the weekend; Granö Beckasin. Here at Granö Beckasin, we rented a cozy cabin for the night. 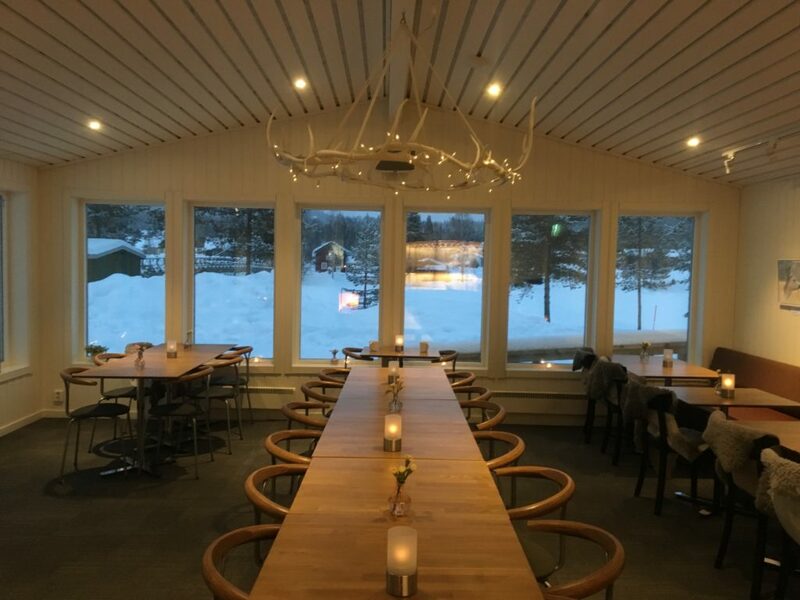 After settling in, we had dinner at the facility’s main lodge which consisted of reindeer, salmon, and cauliflower purée, followed by lemon and meringue custard dessert. 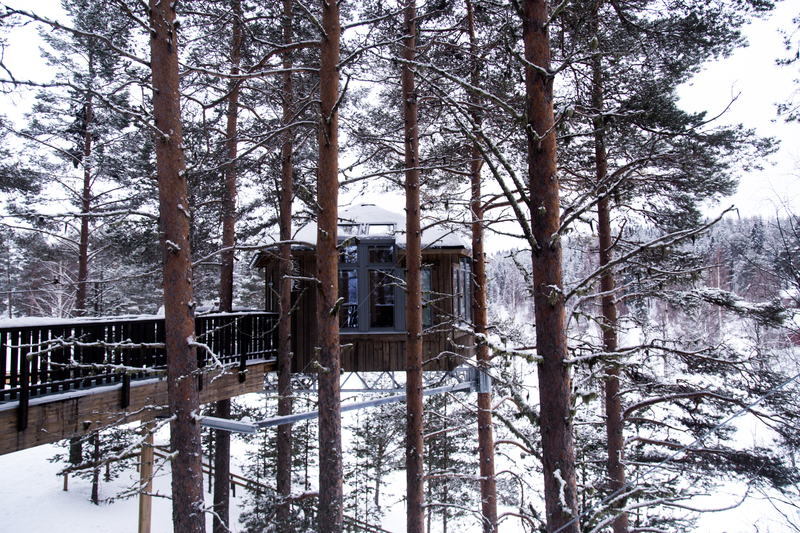 What a treat… If you’re interested in a luxurious tree top lodging, check out their “bird’s nest” cottages, and sleep up in the pine trees! The next day, Sunday, was the grand finale of our weekend. My classmates and I booked a dog sledding adventure at Spruce Island Husky, a local company in Granö. 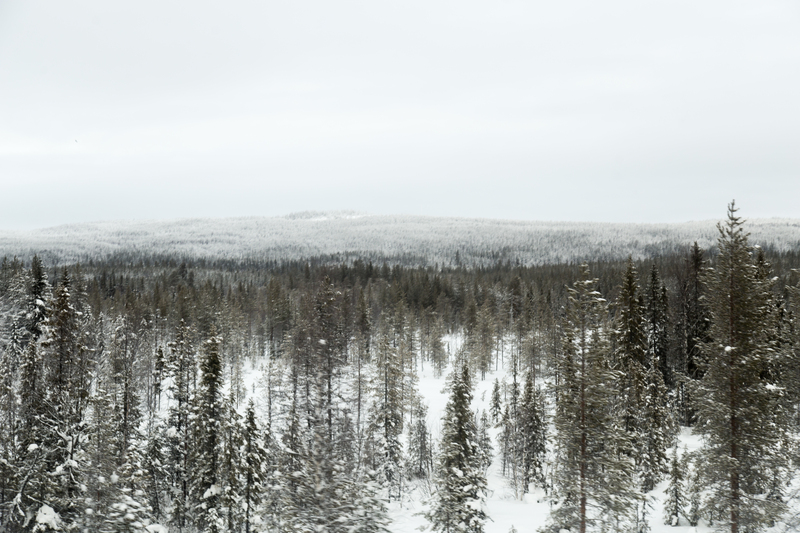 This is only an hour outside of Umeå, and felt a world away. 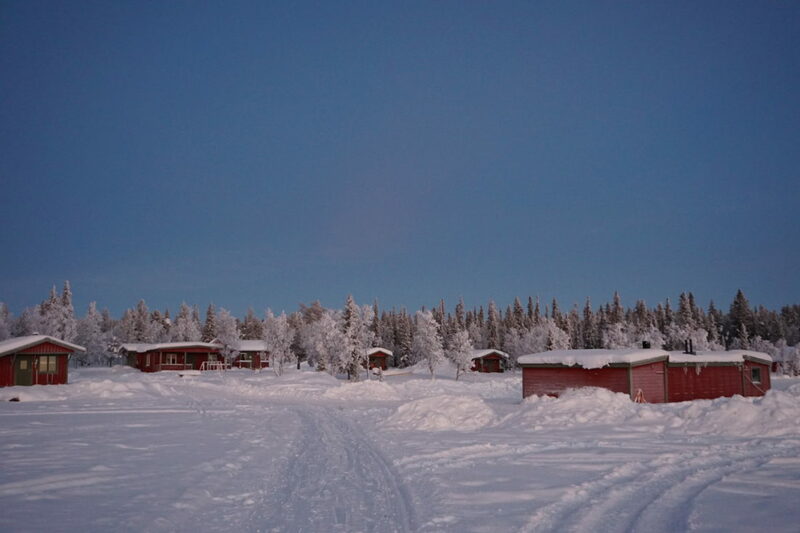 These dog sledding trips can be arranged through Granö Beckasin, where we arranged lodging and dinner. 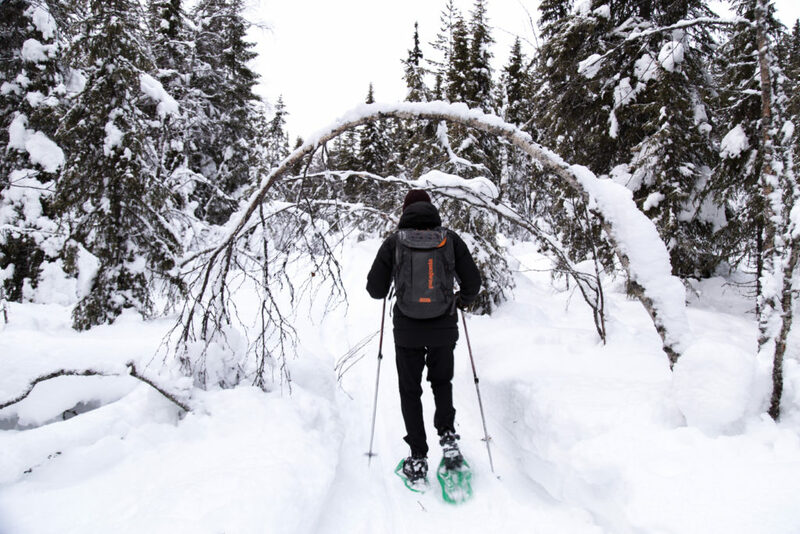 We opted to take just the sledding, but there are other options for student packages that include a lodging, meals, snowmobiling, dog sledding and more. 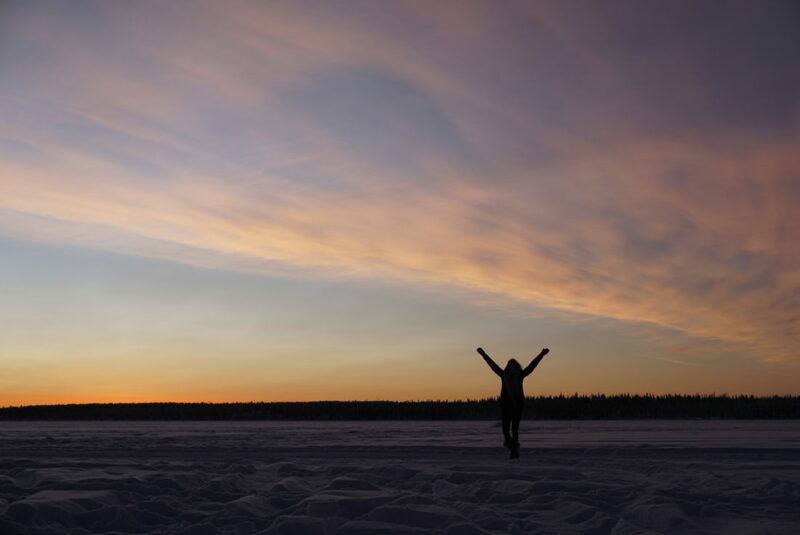 Arriving at Spruce Island Husky, a young woman stepped out of the wooden building and greeted us with a warm smile. 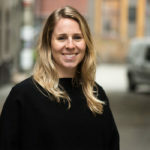 It turned out she single handedly built this company into a thriving business herself, after spending many years training dogs and driving sleds in Kiruna, northern Sweden. We bundled up with warm clothes, and traipsed outside to meet the huskies. They were wild with energy, clearly excited to start running. There were five dogs per sled, either Alaskan or Siberian husky, and had beautifully unique fur. We helped her put on their harnesses, and then were instructed on the technique of sled driving. I hadn’t anticipated driving my own sled! Standing behind the sled with both feet on the brake sunk into the snow, I stepped over onto the sled rails…and we were off! 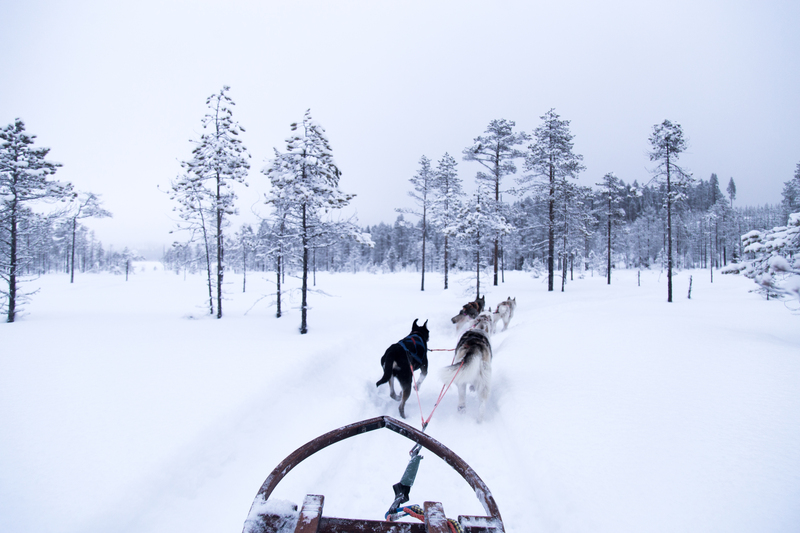 The huskies had such incredible power, and we sprang down the trail in a sprint. We flew by thick forests with snow-covered bows, draping themselves over the pathway and down gently sloping hills that paralleled the mountains on either side of us. Stopping for a quick fika to let the dogs rehydrate with some mouthfuls of snow, we had coffee and biscuits before continuing on to open fields. 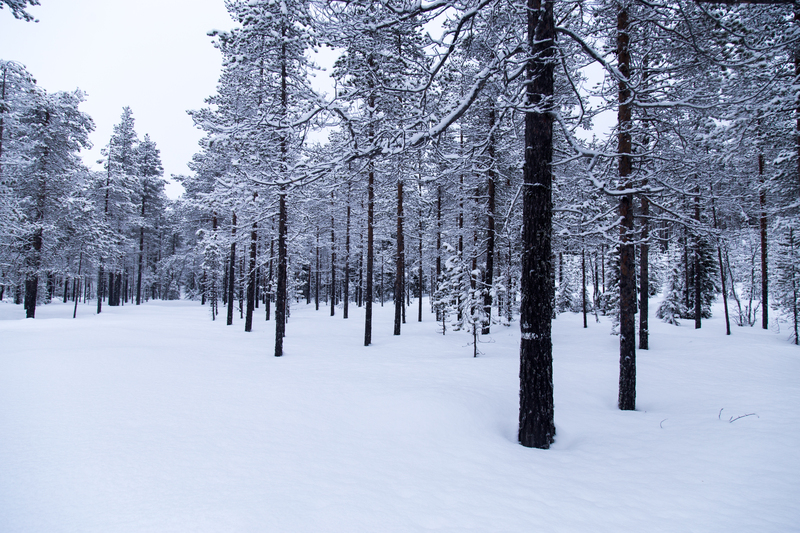 The world around us was completely silent, blanked with several meters of brilliantly white powder snow. 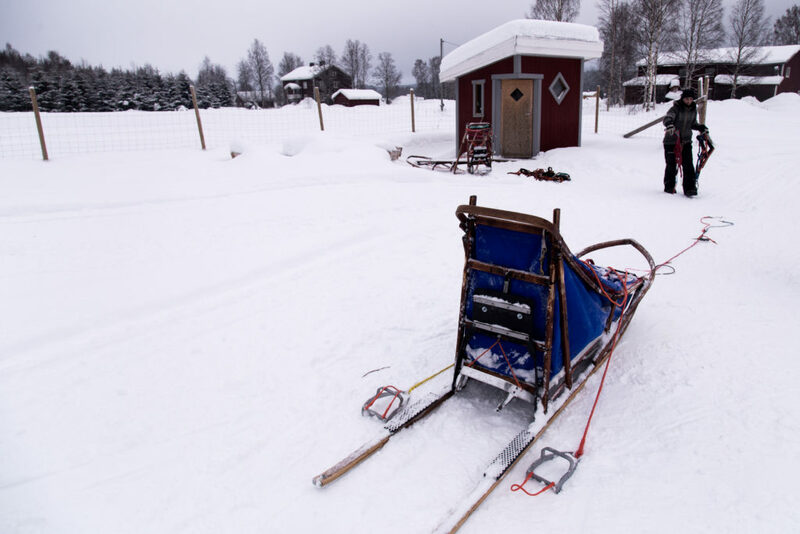 To guide the direction, one must shift weight from side to side and use the edges of the sled to turn. While driving, the metal brake plate could be eased into the snow with one foot to control speed into curves or going downhill. I also learned quickly how exhausting dog sledding is; it was often necessary to jump off and start running uphill to help the dogs. 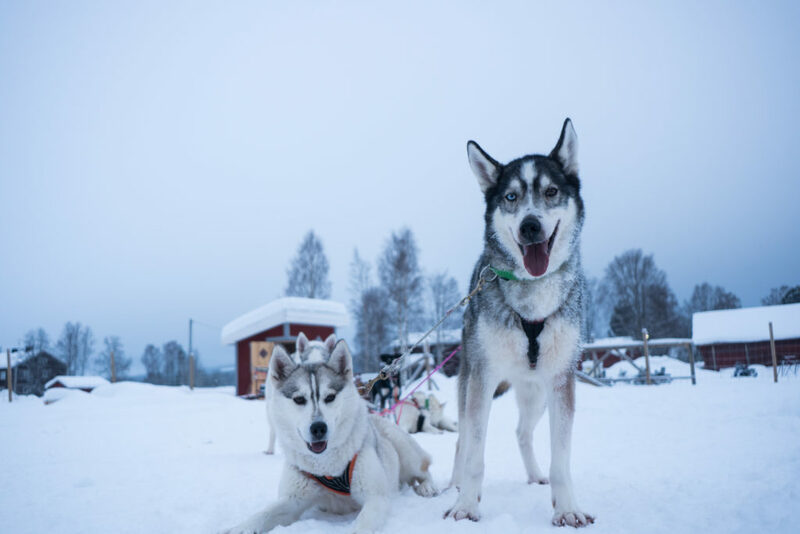 The whole process was quite intuitive, but watching the owner guide her sled and team of dogs, it was clear that she had many years of experience, as she was incredibly agile and knew how to navigate the trails with great expertise. Her bond with her huskies was immediately apparent as well. Three hours later and I was exhausted from sled driving! My classmates and I said our goodbyes to the huskies, and had one last fika before driving the hour back from Granö to Umeå. The weekend had been a wonderful success, and reminded me just how important it is to get outside and go on new adventures! 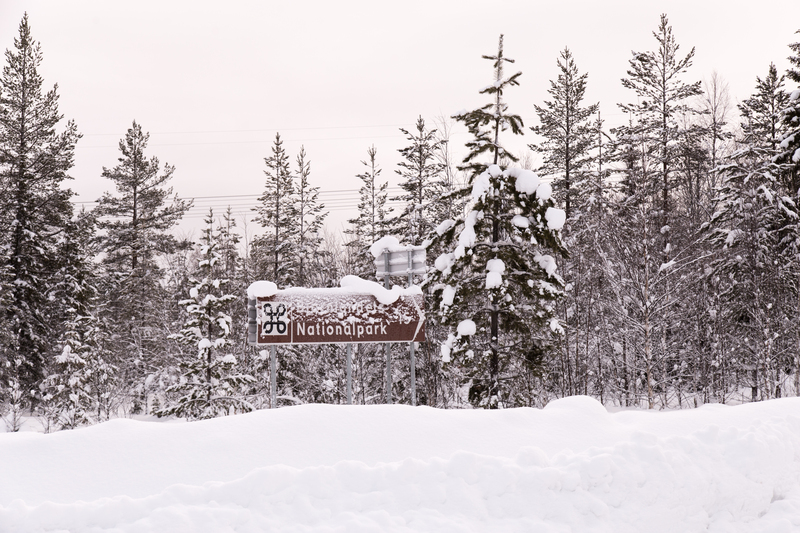 A little while ago, I wrote about my unforgettable trip to Kiruna. 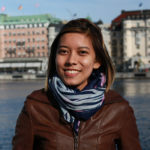 Afterwards, I got a lot of questions about how I organised the trip, where we stayed and what excursions we booked. So I decided to write a blogpost with all the practical information necessary to book yourself an incredible trip to Swedish Lapland. 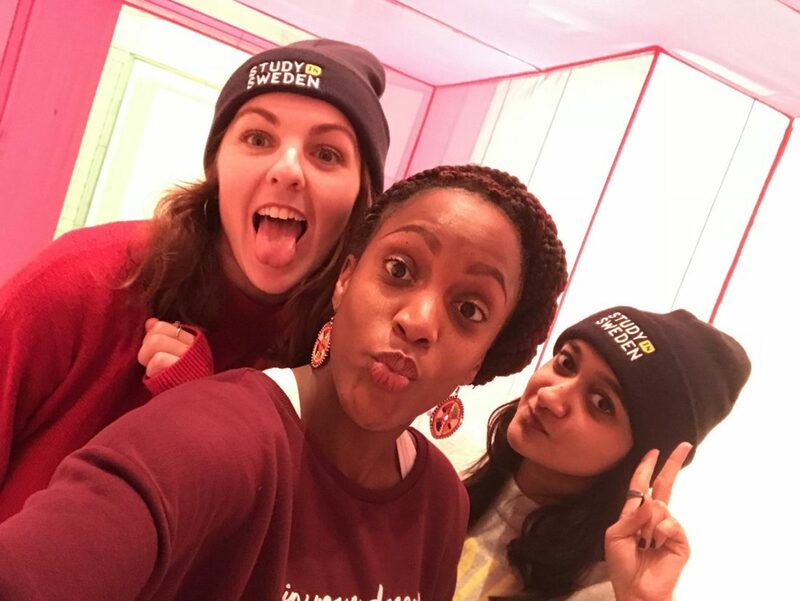 Four times a year the Study in Sweden Digital ambassadors meet to create some awesome and creative content for you guys to enjoy on our social media platforms and blogs. 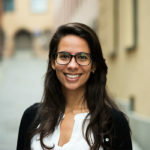 This December our ‘meet-up’ as we call them, happened to be in Umeå. Wow, Carolyn, that is amaaazing!